A trip on the Pecos River requires careful planning; services are very limited. The river runs through private property; camping options are limited to the lower banks; and there’s no cell phone service. 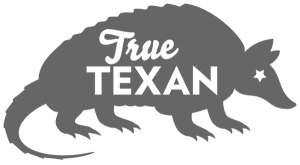 Public access points are at FM 2083 in Pandale and the US 90 bridge at Amistad Reservoir. Comstock resident Emilio Hinojosa offers shuttle services for paddlers; costs vary. Call Hinojosa at 830-317-0760. For nearly a week, an unspooling ribbon of greenish-blue will carry you down frothy rapids, alongside towering escarpments, and into deep, fish-filled pools. You’ll tangle with tall reeds that line the banks, drag boats through a section of bony limestone channels called The Flutes, and camp on rocky riverbanks. And every day, those looming canyon walls will tighten their grip. When you finally take out—because, eventually, you must—you’ll miss the unpolished beauty and rough-and-tumble attitude of the river, which starts in the mountains of New Mexico and cuts across western Texas on the way to its confluence with the Rio Grande at Amistad Reservoir. 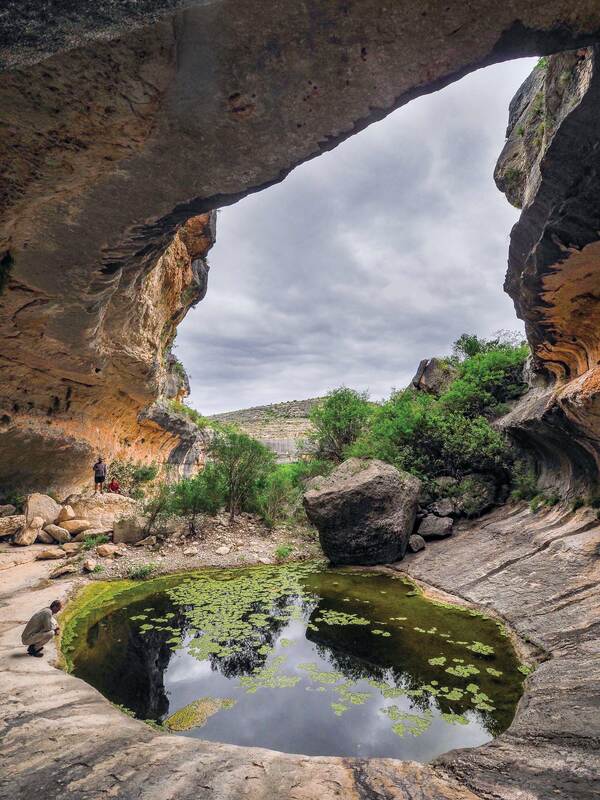 Along the Pecos River and its tributaries, water has carved the limestone bedrock into dramatic cliffs and canyons. A canoe camping trip on the Devils River last spring sparked the hidden paddler inside my soul. I wanted to dip a paddle in as many rivers as possible, especially the Pecos. Logistics are tricky, though. Because public access is limited, paddlers must commit to covering 59 miles between Pandale and the US 90 High Bridge near Comstock. That takes most people at least five days. Outfitters don’t serve the area, although you can call Comstock resident Emilio Hinojosa to deliver your vehicle (and you) to the put-in. He’ll drive it back to Comstock while you’re paddling, and then pick you up at the end. I rounded up some friends and planned a trip for April. As I prepared, experienced locals reminded me this is not a trip for novices. The rugged canyons are prone to flash flooding, so it’s important to stay on top of weather forecasts. They advised me to pack light and take a satellite communications device, patch kit, and spare paddle. Because the water in the Pecos is very alkaline, paddlers should also carry fresh water. I stowed 3 gallons in my kayak, which I would supplement with water I gathered and filtered from springs. I also tucked a copy of Louis F. Aulbach’s excellent guidebook The Lower Pecos River into a waterproof bag. We’d have to choose our campsites carefully. The land along the river is privately owned. Under Texas law, paddlers can camp on islands or below the “gradient boundary,” which often doesn’t allow for much higher than flat rocks on the bank. We got lucky. Houston Dobbins, one of the paddlers in our five-person group and a native of Comstock, knows landowners in the area. He secured permission to visit special sites along the way and arranged take-out upstream of the High Bridge so we could avoid the last 13 miles, notorious for slow-moving water and headwinds. On a cloudy spring morning, we headed to Pandale, tugged our gear across the limestone bedrock, steadied our boats in the slowly swirling water, and left the real world behind. “You’re starting this trip and there’s only one way out—you have to finish,” said Colton Moore, one of our paddlers. 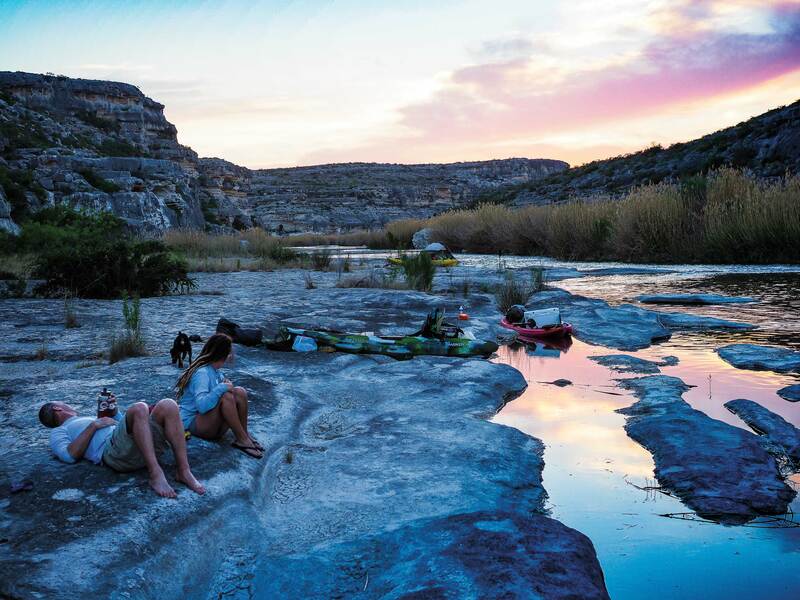 Paddlers relax on the bank of the Pecos River in Southwest Texas at sunset. The river’s flow was low, hovering around 130 cubic feet per second. That meant we were up and out of our boats frequently. We covered a leisurely 10 miles a day and camped on rocky banks, where rushing flood waters have carved cliff sides that look like giant, barrel-shaped ocean waves. We maneuvered our kayaks around boulders and through shallow stretches, and navigated rapids that occasionally tossed us from our boats. We watched one morning as a herd of aoudad scaled a gunmetal gray cliff. We followed a group of white-tail deer swimming downstream. We showered under a mossy spring and dove into pools of turquoise. Owls hooted us to sleep. What we didn’t see is other humans—not a single one, unless you count the proprietors of J&P Bar and Grill in Comstock, who delivered chicken tacos and cold beer the last night. 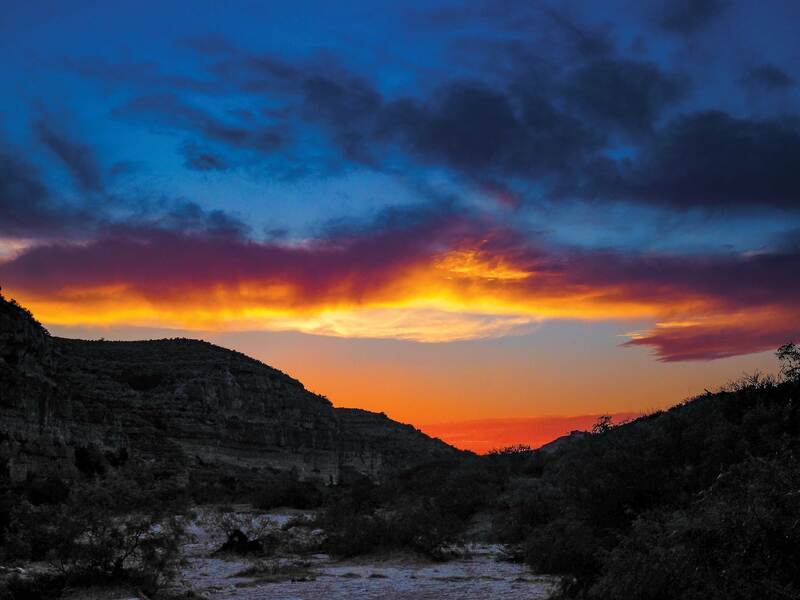 Dobbins, who has paddled the Devils and Pecos rivers multiple times, spent his nights on a $20 air mattress, no tent to spoil his view of the stars. His trusty river dog, Oso, came along too, perching on the bow of Dobbins’ kayak. The last morning, we awoke to skies the color of dryer lint. A front had blown in, and winds whipped. The cliff walls closed in like curtains, and by the time we reached Painted Canyon, where the biggest rapids awaited, I couldn’t stop shivering. We stopped to dry out and scout what lay ahead. Then, one by one, the other paddlers made their way through the rapid. One boat flipped, dumping its occupant into the roiling river. That sealed the deal. Still cold and wet, I decided to let one of the more experienced paddlers take my boat through while I hiked around. From there, we paddled a few more miles through clear, deep water. We glided along silently, reluctant to call an end to the trip. I’d trashed my straw cowboy hat, ripped apart one of my river sandals, and busted my sunglasses. We were tired and sunburned but couldn’t wipe away our smiles as we pulled our boats out of the water. Mother Nature had delivered the perfect adventure.